« Recycle Your Old Phone Books! 6 Comments Posted September 3rd, 2009 . Even though we haven’t used a ton of our black gold bounty, we continue to add more and more organic waste to the family compost pile. We’ve been at it for many moons now, and it’s so much a part of our routine that I can’t imagine throwing our excess food into the garbage. 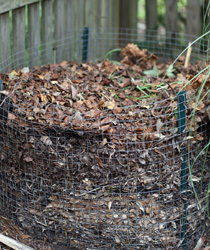 One thing to keep in mind: If you have a compost pile near palmetto trees, watch out for their crawling roots. I went a little too long without turning our pile, and it looks like nearby palm roots have infiltrated the bottom 12 inches, robbing the pile of some of the oldest and best compost. I’m wondering if I should have put a barrier at the bottom of the pile to keep the roots out – any reader advice is welcome. If you have river birches or other trees that drop leaves early, be sure to collect them for your pile. August always brings our birch leaves down in droves, so this is a great source of brown for our pile – I always rake before I mow. Turn your pile! For many reasons, you must do this regularly. Two strange reasons I do: to keep the palm roots from eating from the bottom up, and to keep the fiddler crabs from eating from the top down. Look for bugs…you want bugs. If you see worms, that’s good. If you see termites, that’s bad. During peek fruit fly season (now), you might need to make more trips to the backyard pile. Our kitchen composter it too tempting for fruit flies, so we take our scraps out right away. these kinds of as cleansing dentures, feeding individuals, having temperatures and measuring catheter output, all of which totally get ready students for the expertise evaluation test. mixed and kind of confusing. But first, here is a list of a few of the similarities:. because it provides you with nutrition. averaging 1 to 3 pounds per day, most aim to lose 30 pounds in 30 days. a half a gram of fat per serving. I couldn’t refrain from commenting. Welll written! for that reason, and obtain the latest news.